Thankfully, unlike much of the state, my garden is headed into July with plenty of moisture as it rained regularly here throughout June. As a matter of fact, it rained so much that I’m still having trouble keeping up with mowing and weeds. Being a farm boy I have much more to mow and weed than a typical suburban gardener. If I don’t stay on top of it each week I find myself hopelessly behind and grumpy. Not a week goes by that I don’t need to use the push mower, riding mower, finishing mower, bush hog, and both the hand tiller and tractor tiller. Unfortunately the back and hips were grumpy in June as well which didn’t help the situation. If I had known I was going to fall apart so early I would have probably invested in a tiny townhouse with only a small courtyard to dote over! I do however look forward to June every year as it heralds the arrival of some of my favorite plants. First on that list are crapemyrtles. I know some people think they are overused, but they certainly are showy and tough. I only grow two old indica types but sure look forward to their respective pink and lilac-purple blooms each year. The pink ones framing both sides of my house were propagated from cuttings taken from those at my Emanis great-grandparent’s old homesite in the woods not far away. 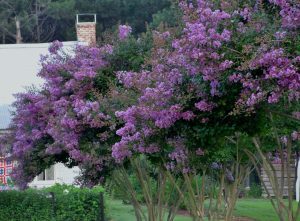 I propagated the lilac-purple ones forming the alleé along my driveway from the old Ezra and Thelma Wheeler homesite in Arcadia were my dad raises cattle. Purple crapemyrtles are my favorite of all. I chose both of these old selections after the early 1980’s freezes when it got zero degrees. A number of crapemyrtles in East Texas froze to the ground that year including most of the new hybrids. But the two that I chose to grow didn’t suffer any damage. If I was going to feature them framing the view of my house I wanted to make sure they were permanent. Ever since I was a child I’ve enjoyed peeling the exfoliating bark from the trunks of crapemyrtles at the beginning of each summer. I know it falls off by itself but it looks kind of ragged in the mean time. I expedite this process now by using the blower to force off the old shredded bark followed up by mowing the fallen pieces so they’ll disappear. I love seeing the freshly exposed new bark below too. The whole process reminds me how we foolishly used to sun burn and peel as kids. With the rains, most of my crinum collection bloomed in June including my Grandmother Emanis’ favorite, Ellen Bosanquet. I have them lining my front porch under the eaves of the house. Crinums have huge bulbs and root systems so are good to use as “splash pads” where one has no gutters. They also enjoy the much needed water that runs off my old tin roof during droughts. Most crinums come from parts of Africa that alternate from drought to flood like we do. 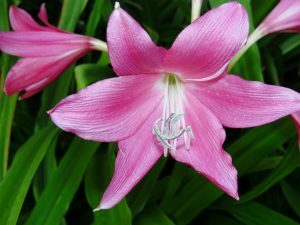 Miss Ellen has always been known as the “red” crinum but is really just hot pink. 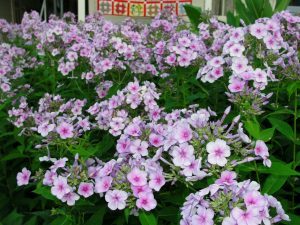 Another welcome feature to my June garden was my plethora of John Fanick phlox. He’s a prolific perennial that I named for a late nursery friend in San Antonio. The fragrance and flowers for cutting are wonderful but the swallowtail butterflies are even more valuable to me. The last week of June also marked the beginning of my Sweet G-90 corn harvest. As always, I planted too much as I’ve already picked several hundred ears and I’m not even half way finished. The wind and rain we’ve received blew a number of the stalks over allowing the squirrels to help themselves to several dozen ears while I was at work. Acer and Ilex will take care of that since I’m taking a “stay-cation” the first week of July. 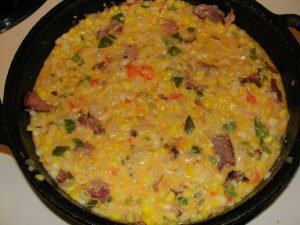 I dearly love fresh sweet corn but also grew up eating harder to prepare creamed corn for holidays and special meals. This year I learned to make maque choux, a seasoned staple Cajun version featuring sautéed bell pepper and onion with a crushed tomato, smoked sausage or tasso, and some heavy cream added. When you eat corn every meal for a week you have to improvise! All my nephews are supposed to show up in Arcadia the first week of July so hopefully they’ll plow through some ears. 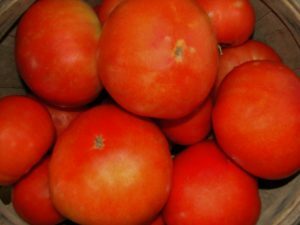 As usual, June also meant the arrival of fresh tomatoes. After a slow and dicey start my Tycoon and Valley Cat tomatoes from Dr. Parsons finally hit their productive stride along with my two rabbiteye blueberry bushes nearby. I did have to resort to bird netting as it became obvious I was going to lose my entire blueberry crop to my feathered friends. Unfortunately the warm weather is bringing my Italian style pole bean harvest to an end. I’ll sure miss them, as they’ve been delicious.